Madame Tussauds revealed its Steve Wozniak wax figure Saturday morning at the Silicon Valley Comic Con opening ceremony. The figure will be on display at Tussauds' Comic Con booth for the entire weekend before it's moved to its San Francisco location for permanent display. Steve Wozniak, left, next to his wax figure, right. Chris Cooper, Madame Tussauds general manager, said that the company held a vote to see which technological innovator would receive a figure. Wozniak overwhelmingly won the poll with over 60 percent of the vote, beating out other tech luminaries like Tesla CEO Elon Musk. When the red covering dropped it was revealed that Wozniak, who had wandered off the stage moments before, was posing next to his figure, trying to keep as still as possible. After some quick antics, which included the opening ceremonies' hosts pretending the wax Wozniak was the real Wozniak, the Apple co-founder talked about how surprised he was about the process. "The incredible art and precision that went into every little measured detail for about five hours," Wozniak said. "The features at every angle and the human work to make it come out realistic looking. I did not know there was so much involved, I thought you take a picture and a computer prints it out." 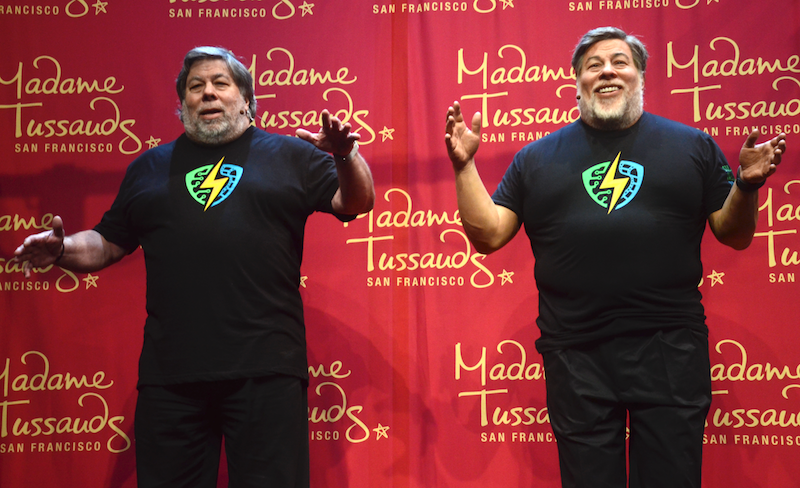 Wozniak also said that it was an honor to have a wax figure because he had always wanted one, mentioning the wax figures of superheroes he saw in wax museums when he was younger. Before inviting the attendees to have fun on the convention floor, Wozniak spoke a little about his inspiration for creating a Comic Con. He noted how that when he was younger, he and the other employees at Apple didn't dress up like employees at other tech companies. They were geeks and outcasts that didn't necessarily fit in. Naturally, they looked to science fiction and superhero stories as a way of escape, and Wozniak says modern technology makes him feel like he's a part of those worlds. He noted the ability to push a button in an app and summon a car to take you somewhere as similar to a super power. "I love technology, it makes me feel like I'm a superhero in a way; I'm so much more powerful than I would be without it," Wozniak said. "Now the whole process is you have imagination. Things that maybe don't exist in the real world but they exist in your world, in your head. Then we have the ability to realize them, to make them real." That took a lot of wax. Luckily he isn't still at Apple or they would need a thinner version each year. Sorry, I had to say it! It's great to see Woz getting the recognition he so richly deserves. He single-handedly invented the personal computer as we know it, so he deserves just as much—if not more—recognition as Steve Jobs. The figure will be on display at Tussauds' Comic Con booth for the entire weekend before its moved to it's San Francisco location for permanent display. You got those words the wrong way round. So notice the weight difference from the left to the right one. It looks like they added another 100 pounds. 3d print an iWoz instead of wax. lol they made his wax figure look super lumpy. Woz isn't a small guy but the wax figure looks like crap. They made his face thin as well. They also messed up the legs. Overall awful. No, words are just fine, but the damn apostrophe doesn't want to stay still. Should be "... when he was younger, he and the other employees..."
The exception is articles appearing on our Front Page, Mac Blog, and iOS Blog. These entries are created by our professional staff. If you notice a spelling or grammar error in these articles, please send an e-mail to tips@macrumors.com. I noticed the its/it's errors ('http://public.wsu.edu/~brians/errors/its.html') and sent a second e-mail to the editors after seeing User008's comment here. I am fond of citing the Paul Brians webpage entries for explanations.